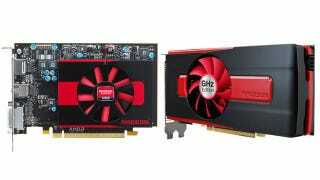 AMD's got two new 28nm video cards today, the AMD Radeon HD 7770 GHz Edition and the 7750. Compared to top-tier cards, they're pretty darn affordable, but not without a few concessions. The 7770 is the first graphics card with a 1GHz GPU that's not simply overclocked, according to AMD. And compared to some other budget-busters, it's pretty affordable at $159. But for all the clockspeed, it came in middle-of-the-pack compared to still-more-expensive cards in AnandTech's benchmarks. That's very impressive company, but fastest clock doesn't necessarily mean best.